Lunar New Year of the Pig 2019:let’s celebrate and protect them! let’s celebrate and protect them! The Year of the Pig began worldwide this morning. On this occasion, the World Organisation for Animal Health (OIE) wishes you an excellent Lunar New Year, while reminding all festive travellers of their responsibilities to protect the global swine population which is currently in serious danger. Each of us has a role to play. Paris, 5 February 2019 – Welcoming the Lunar New Year 2019, pigs are being celebrated today by over a billion people worldwide, particularly in the Asia region, the world’s largest producer of pigs (57.6% of live pig production in 2017). However, the deadly African swine fever (ASF) virus continues to decimate swine population in Asia, Africa and Europe (see last report here). While millions or even billions of people are travelling this week to celebrate the Lunar New Year with family and friends, the World Organisation for Animal Health (OIE) urges each of us to respect basic rules to avoid further spread of the epidemic. From normal travellers, to farmers and customs officers, we all have a role to play to avoid carrying the deadly virus across regional or national borders. As underlined in the new OIE communication campaign released today, ASF kills pigs, both domestic and wild. It is not a risk to human health, but affects animal welfare, causes severe production and economic losses, and can threaten food security. Recent reoccurring outbreaks of the virus have sparked concern in both affected and unaffected countries. The transmission of the disease is strongly linked to the movement of domestic and wild pigs, as well as pork products. It can also occur via contaminated materials, feed and fomites, such as shoes, clothes, vehicles or equipment due to the high resistance of ASF virus in the environment. To avoid further spread of the disease, it is becoming exceedingly more important to respect and take general precautions. 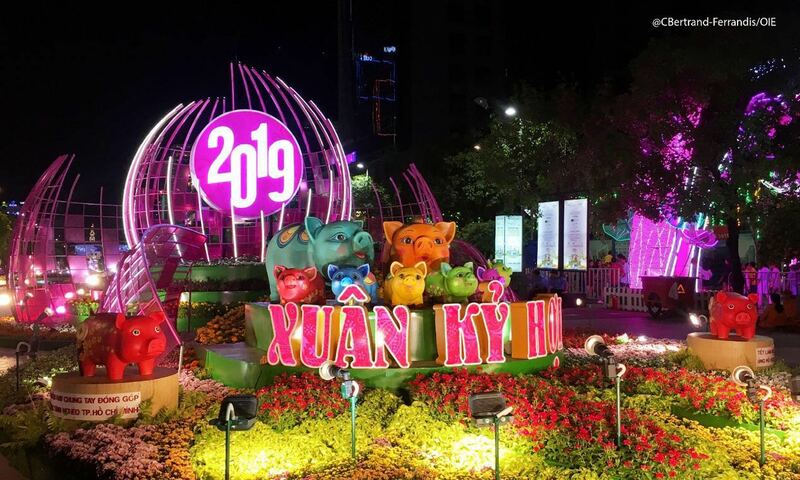 The celebration of the Year of the Pig 2019, which leads to massive movement of human, swine populations and products, is consequently a high-risk period for the transboundary spread of the disease. Commercial pig farms staff, pig farmers, hunters, transporters and customs check point staff are also involved in the prevention. The campaign “ASF kills pigs” provides posters, infographics and short animations, explaining to all relevant actors how to protect pigs and the farming economy. You can discover ASF tools here, and new tools added in the following days. Travelers, farmers, pork consumers, hunters and more, you all have a role to play: Let’s celebrate pigs in the New Lunar Year of the Pig and protect them worldwide!